Set the alarm for 7:00, packed up, cleaned up and dumped by just after 9:00. Headed out looking for someplace for breakfast, and ended up not finding one until it was past breakfast time. Had to go to a McDonalds (our least favorite fast food), where we ended up having burgers at just after 11:00. It seems Subway has a lock on all the gas stations chains throughout this section of I-40, and I REFUSE to eat what they call breakfast at Subway! Stopped once at Camping World to try to pick up a new electrical cord (our old one has a weak spot in the middle), but they didn’t have it (what else is new, they never seem to have what we need at CW). Found a Wal-mart with gas, so we killed two birds with one stone, got our shopping done, and headed toward ever-darkening skies. We had put the tarp on last night, but it was flapping away, and the net we had put on top of that gave up the ghost and flew off irretrievably far back on the freeway. We did our best to secure it, but we ended up deciding to just take it off and hope for the best. We did run into some rain, but these bales are packed pretty tightly, and it was supposed to be sunny the next day, so we figured it would be safer without the tarp. SO glad I confirmed with the park which way to enter. The first exit was obviously closer, but was SO full of switchbacks, sharp turns and a dramatic drop off on the edge of a crumbling road, we never would have made it with our rig. 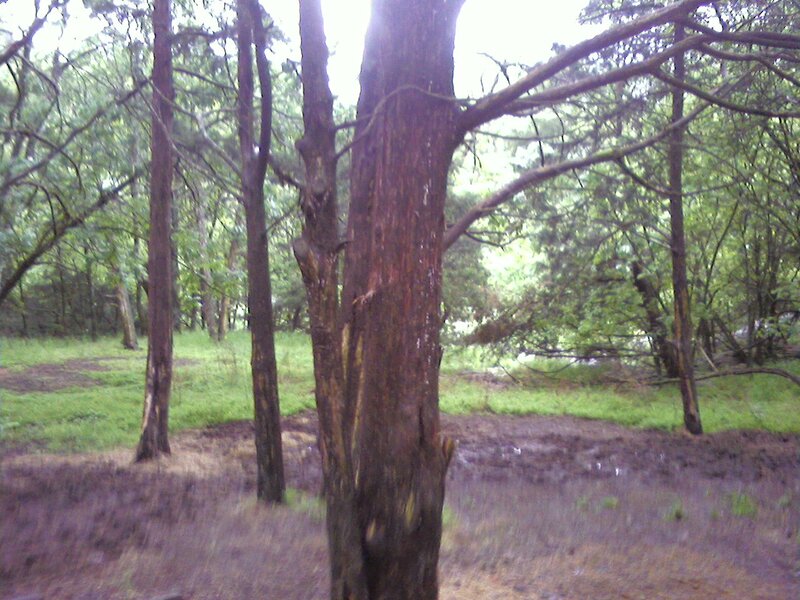 And actually, the horse camp is on the north side of the park anyway, so it was a bit closer taking the second exit. It was still a steep hill down, but the road wasn’t anywhere near as narrow or curvy. I did smell my brakes burning by the time I got to the bottom, though! The horse camp is down a gravel road just a short ways, there’s a single loop with sites inside and out, all with water and electric, mostly level. We decided later, though, we prefer being on top of a mountain rather than in a hollow below it. It was fairly muddy with the rain, but we managed to fine one spot where we could highline the horses where it wasn’t too bad. Settled in later than we had hoped, by around 6 pm. What a lovely ride we had today! The footing on the trails was a soft soil they call “loess” in the brochure, though it was gravely on the connector trail from the campground to the trailhead, but there was enough of a shoulder on the road to avoid most of it. The trails were well marked other than at the very first intersection, and it was pretty obvious which way to go from the trail map. Every other intersection was well marked, with a You Are Here plaque and a number on the post. We took a loop that came out to be about about 7 moderate miles in all. 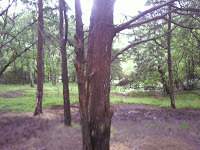 Some of it was on trails so ancient the tree roots were above our head! 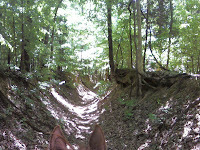 (see pic-this is from horseback!) The horses were excellent, happy to go for a ride, but not at all overly exuberant, just right. There were a few places where we trotted, and one long stretch where we had a lovely cantor/gallop. At the end of that, however, just before we were to make our turn to come home, Hubby noticed my saddlebag was unzipped, and an inspection revealed I had lost a plastic bag of tissues. I felt guilty for littering, but we didn’t really think is was necessary to go back. Once I realized we were ahead of schedule, I changed my mind and decided to go back, as it couldn’t be very far back. A few minutes later, Hubby realized that he, too, had lost something, his water bottle that hangs from his horn, so we were both glad we had that decision. We found my plastic bag almost at once, then had to go a bit further to find the bottle. Once we did, we headed home. 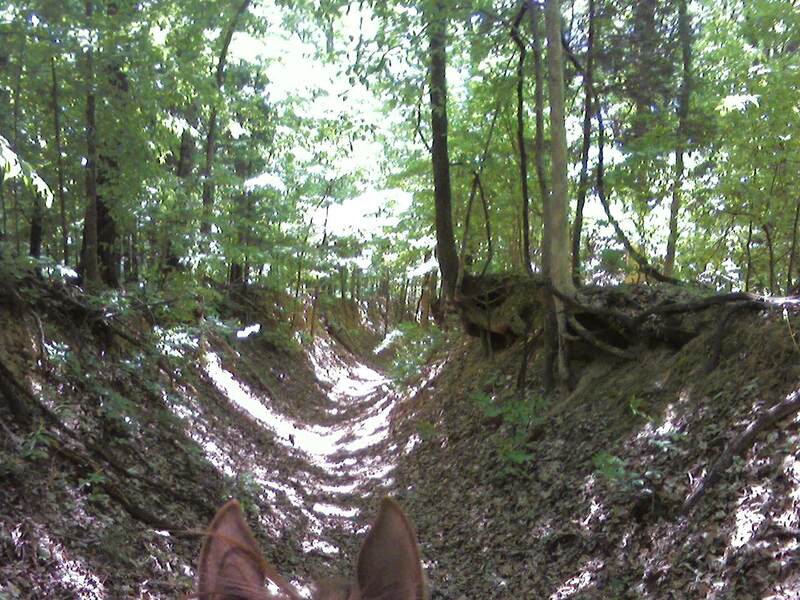 There was only one obstacle that we problematic, a creek crossing that was badly bogged, so much so that my horse, while he went over it the first three times, refused on the fourth, and I had to get down and persuade him across. I don’t blame him, he sank way up his fetlocks, and he was fine after that. When we got back, we gave the horses a bath at the wash rack next to the stables, and sprayed them with fly spray, as it was the first time they had been bothered by flies on the trail. Settled down for the evening, well-satisfied at our day’s adventure! Got up when the alarm went off at 7:00, got everything packed up and ready to go, and even finished dumping by just after 9:00. Had a nice chat with the campground host Dave and his wife, then pulled out in plenty of time. Stopped at the Flying J in W. Memphis, even took the time to have a sit-down lunch there. Arrived at Village Creek around 2:00, and once registered, found our way back to the horse camp. This is a truly nice park, with lots of facilities like tennis courts and ball fields, and it’s right on a lake with plenty of access to the water. The horse camp is well-manicured, with lovely stables in the middle of the loop, and all of the campsites around the outside of the loop. Got the horses settled in, then the RV, did a few chores on the computer, then relaxed to a movie. About the only downside was that the campsite we were in was in the wrong place for a satellite signal, though most of the other campsites would have worked. There’s a big bluegrass festival here this weekend, so we were lucky they had any space for us all, if only for two nights. They were completely booked for the weekend, so we couldn’t stay longer even if we wanted. Looking forward to a nice ride tomorrow! Slept well, except for the traffic noise in the distance. The good thing about Natchez Trace is the same as the bad thing about Natchez Trace. It’s very convenient to the freeway. Just 2.2 miles off I-40, it’s very close when you’re passing through, but there is that constant thrum of traffic all night and day. In any event, I spent some time in the morning solving more potential problems, then finished off well enough to get a ride in. Left about 11:45, on a trail that was just across came from where we camped, and were grateful the trails were fairly well marked. We only came close to getting lost twice. 🙂 The trails were well worn, many were washed out with bypasses around them, but for the most part the footing was very good, mostly sand and clay. Only had one road that had some gravel on it, but nothing significant. We took our boots along in the saddlebags, but never felt it was necessary to bring them out. Rode about 7 miles, was back in camp before 2:15, which was just right. We just wanted a ride long enough to work out their energy, not enough to wear them out, and that’s exactly what happened. The horses had more energy than we expected after their long trip on Sunday, but they are getting so fit now that they really need to be ridden every few days. But then again, it was cool and there was intermittent rain, so that may have affected them as well. Spent some time finding more horse camps on our route, then had a relaxing evening, getting ready for another travel day tomorrow. Though we had alarm set for 7:00 we got up at 6:00, because we both woke up worried about all the problems we had to solve today. Was loaded up and ready to go by the time Lena arrived at a bit before 8, then we headed out as soon as we could. The horses were a bit reluctant to get in the trailer, understandable after they spent so many hours in the trailer yesterday. Once in, we headed straight to the Kinslow Animal Clinic just up the road, where I had arranged to get Coggins Tests done on the horses, as their 6 month passports are due to expire in May. That was done relatively quickly, then we moved on to the tire store that I had found, that actually did have the tires we needed in stock. We bought two, one to replace the blowout, and one to replace our sturdy spare, because it was still a D load eight ply tire. We had the oldest and only remaining tire that we bought just a year ago put under the RV as a spare, so now we have all new tires, albeit not all the same brand. We then went to Wal-mart to shop, and the liquor store, then the gas station, so all we had left to do was to get to Natchez Trace State Park in Wilderness, TN, about 30 miles east of Jackson. We planned a short trip, because we knew we would be delayed with all the running around we had to do. We left Lebanon feeling much more confident that we had done all that could be done to prepare for our cross country trip. We arrived at Natchez good and early, by three-ish, and walked around to find a good spot, finding a place where we could get a satellite signal and have enough length to fit in both vehicles. Got the horses on a nice long high line, then settled in for the evening. Once again, thinking we had a short trip, we let ourselves sleep until 8:00, as we estimated the trip to be just 5 ½ hours or so. Our first stop was just 40 minutes from our departure at 10:00, at the Flying J in Wytheville, VA, in order to dump the tanks and get fuel. As I maneuvered into the dump aisle, Hubby pulled in behind me and turned the pickup off. We then noticed that the dump on that aisle had a very high curb, making it impossible for us to use it (gravity works, water won’t flow uphill), so I moved over to the pumps for gas. Hubby then tried to start the pickup, and it wouldn’t turn over, it just clicked. He popped the hood and started playing with wires, then decided the starter motor must have frozen, so he got a wrench, and later a hammer, to try to knock it loose. He also noticed that there was another RV dump on another aisle that had a low curb, so I after I gassed up, I moved over there and started on that job. Meanwhile, I went back and forth to help him try to get the pickup started. Hammering wasn’t getting the job done, but I noticed that after I would try to turn over the motor, the interior lights would cut out, then after a few seconds, would click back on again. I told Hubby I thought it was behaving more like a near dead battery than a starter, even though the lights were coming on with no problem. Well, after another ten minutes of banging and cooling down the starter motor, he decided to check the battery cables more thoroughly and discovered they were, in fact, badly corroded inside. So he cleaned those up and lo and behold, it started right up. This little episode wasted almost an hour, putting us under a little more pressure, as we had to be at Cedars of Lebanon just east of Nashville by 6:00 to check into the stables. So we hit the road again, going a bit faster than usual to try to make up some time. Just before we came to the I-40/I-81 fork…BOOM! Another flat tire! We pulled off to the side and did our thing, changing the tire in ten minutes, but now we had a problem. Do we try to find a replacement tire on a Sunday, or do we risk trying to make the remaining 150 miles without a spare? I started calling every tire place Gracie (my Verizon GPS), but couldn’t find any open, at least not before Knoxville. The ones I did find didn’t carry the tires we need. It wasn’t until we stopped at the Flying J on the far side of Knoxville when I spoke to a guy at Pep Boys who said they had the tires. I grilled him three times about the size and load range (E-ten plies), but he assured me they had 5 in stock, so we turned around and went back ten miles to their store. After ten minutes of searching, it was discovered that the tires they had were only 8-ply D Range tires. We were PISSED! We lost nearly another 45 minutes coming and going, and didn’t even get what we needed. That’s the last time we’ll be patronizing Pep Boys, now that we know that they use the “bait and switch” method of sales. Well, we had no choice now, we had to make it straight through, and risk running without a spare. We hit the road again, keeping our fingers crossed, and hoping that lightning would strike twice. I mean, how many times can you have two flats in one day? It’s already happened once on this trip, is it possible it could happen twice? Astronomical odds. Well, we managed to arrive right at 6:00 (after having gained an hour moving from Eastern to Central time), and were welcomed by Lena at the stables. We filled the water tank, got the horses settled in stalls, had a drink, took a show, and soon hit the sack, as we have a busy day tomorrow! Saturday, April 24, 2010 – Little Horse Gap Loop DONE AT LAST! After a hearty breakfast, we headed out, determined to FINALLY discover exactly where this mysterious trail was. We started out in the usual direction up Hoof and Hill trail out of the campground, then stayed with it all the way to Pearis Thompson trail, one we hadn’t done before but was just a slightly larger loop that ended back at Berry Road, which would take us to Little Horse Gap Loop. We almost made a wrong turn there (these maps really are terrible! ), because the map showed that the trail ended in a T and to turn right. In reality, it was not a T at all, there were two rights at a three-way intersection, one that went up and one that went down. Since we already knew we had to go up, we took that branch. Fortunately, we were right, and it brought us back to Berry Road, which led us up to the Little Horse Gap Trail. I must admit, my horse didn’t seem too enthusiastic, he obviously thought we were going on another endless journey, but he brightened up a bit when we turned the corner we had missed on Thursday. Almost missed another little sign that pointed uphill, rather than the obvious road right in front of us, which would have undoubtedly taken us off the reservation again. After the halfway point, we ran into a bunch of crews that were doing forestry maintenance, though they were breaking for lunch when we passed. They were all very accommodating, moving off the trail to give us room, with all the pleasantries afforded. After we passed them all, we stopped for lunch beside a creek, where the horses were delighted to get a feedbag of grain. After the break, we finished up the trip, recognizing the last intersection from our previous adventure, so now we know how to take the trail backwards in the future. There was no sign or blaze at all on that corner, so it’s not surprising it is easily missed. One note I should make is that boots or shoes are a real necessity for these trails. There a few spots with dirt and sand, but most are rocky and many roads are gravel or gravel and grass. Anyway, it was a wonderful day that we thoroughly enjoyed, expeciallyt without the added stress of being lost! Got back in good time, and started to get ready for tomorrow’s departure. Spent the day resting the horses and doing some work on the computer in preparation for our new agenda, heading out to Colorado. Arranged to spend Sunday night at the Cedars of Lebanon State Park stables (privately owned) just east of Nashville, and confirmed that our next stop, Natchez Trace State Park near Jackson, TN, doesn’t take reservations, they’re first come, first serve. So we’re all set for the next leg of our new adventure! Thursday, April 22, 2010 – Ride Day at Last! Finally we had a nice warm day, only a very slight cool breeze which we only noticed right at the top of the mountain. Last time we were here at White Cedar, last fall, we got lost. Though the map shows a number of easy loops, we missed a turn on Little Horse Trail going counterclockwise (the trails are very poorly marked once you get in the back country), and took a trail that went WAY off the reservation. We finally had to turn around, just to get back before dark. This time, we decided to take the same loop in the opposite direction, to see where it came out. Lo and behold, we got lost AGAIN! We rode for three and a half hours, never finding the other end of the loop. Instead, we finally reached a dead end at private property, which was just as well, because we were just about at the point of no return. So once again, we backtracked, making some judgments of where we must have gone wrong. One was a turn that looked more like a stream bed climbing up a ravine rather than a trail, but that had to be the turn we missed. Not realizing that was a turn, we thought the next turn to the right must be it, but that if we kept going we’d be taking the outer loop which curved back into the same trail. Whatever, we made it home around six, after having left at 11:30. About a mile before we got back to the campground, we saw a lost EZ boot on the trail, which we left because we figured someone might be coming back to look for it. When we got back to the campground, we discovered another trailer had come in while we were gone, so I rode over to see if they had lost an EZ boot, and yes, they had. I showed them on the map where it was. Oddly enough they had also found a tupperware container that I had been unable to find at lunch time, and thought I had forgotten to pack, but apparently it had slipped out of my saddle bags at some point. So lost and found was in full swing this evening! Despite the hour of anxiety about being lost, it was a very enjoyable ride. Something must’ve told me something would happen, because for the first time ever, I packed up some grain to give the horses if they got too hungry, and they sure did! They had a great time until about the last mile or two, when fatigue started to set in. Nevertheless, they did great, lots of trotting and cantering, not overly excitable despite the two week layoff, but just the right amount of controllable energy. They’ll have tomorrow to rest. Weather allowing, we’ll go out again on Saturday. We’re determined to find the entire Little Horse Loop! It was a beautiful ride, though, lots of hardwoods, babbling brooks and even a long stetch of magnolia tree tunnels! Kind of spooky, but not enough to upset OUR horses. They’ve seen it all by this point! Well, naturally, no sooner did we load up on hay than we got a request from a client for help. This entails hop-scotching to Colorado over the next two weeks. Had we found out two days ago, I would have just headed home, filled up with our own hay, and headed out next week. But then again, every time we go home we find jobs to do, so it’s probably just as well! Spent the bulk of the day online trying to figure out what horse camps we can stop at every 300 miles or so between here and there. I had all this information at one time, but lost it all when my computer crashed last October, and again last month (I thought my Carbonite backup would keep it, but apparently Google Earth can’t make heads or tails out of the My Places information…sigh), so I’m back to square one. Good thing I have a pretty good memory, by the end of the day we had pretty much figured out a route that will serve the purpose, and give us time to drive a day, then rest or ride a day. Not quite the hell-bent speed we had to go last time, so it should be more pleasant on this trip. Once we get out there, we can stay for several weeks, which will give us a good chance to get caught up on everything again, from rest to mail. Once again, we didn’t ride today, although that cold north wind just keeps persisting!